I am so excited to be sharing this simple Lorax craft today. It only takes a few minutes to make and would be great as an activity and healthy snack for a Lorax movie watching party, Dr. Seuss Birthday Party or Earth day celebration! Just grab your favorite clementine, like Halos, and glue googly eyes and a yellow mustache. These make a super easy to make and you have a healthy Lorax snack! I had to draw the mustache a few times on paper to get the size and shape to work with the little oranges. Then I used the template to cut mustaches from yellow felt. It’s super easy once you have a template – so I’m sharing one below. 🙂 I used a hot glue gun but regular glue would work better for little kids. 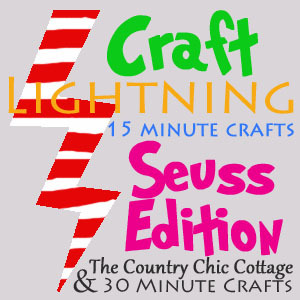 Looking for more awesome Dr. Seuss inspired crafts, check out the Craft Lightning 15 minute Crafts: Seuss Edition! Totally clever Dr. Seuss idea! LOVE this! Such a quick and cute idea. This is such a smart idea. Every kid loves clementines… and dressing them up like little Loraxes? So smart!